The Dunlop Midi Standard .67 mm gauge nylon pick is the pick I choose most often when playing acoustic guitar. I really like how these nylon picks sound when playing acoustic guitar. They flex quite a bit, which is perfect for strumming chords. This allows for all types of strumming patterns, arpeggiation of chords, and for some single line notes. 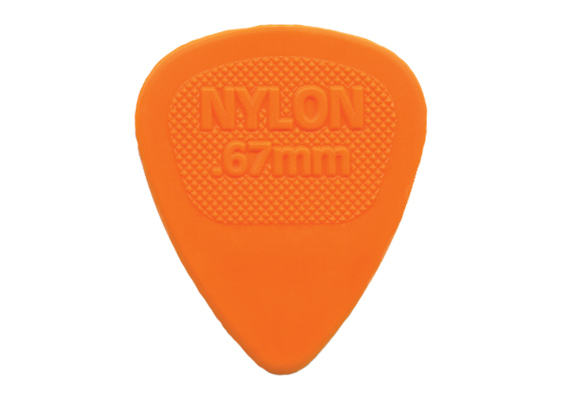 If I want a little more stiffness I will switch to the .73 mm gauge in Dunlop’s Nylon Standard line of picks (.38, .46, .60, .73, .88, 1.0 mm), which also sound very good when used with the acoustic guitar. What is nylon? A tough, lightweight, elastic synthetic polymer with a protein like chemical structure, able to be produced as filaments, sheets, or molded objects. In our case molded guitar picks. For more information on nylon’s history look here. As you can see in the picture these nylon picks have a raised surface in the gripping area, which allows for a very secure grip while playing. I have not had a problem with these picks moving around or slipping out of my fingers. I do not use nylon picks when playing electric guitar very often, but the 1.0 mm gauge is a good pick to use if you are into playing Funk guitar or want to learn this genre of music for guitar. How does the Dunlop Midi Standard sound? 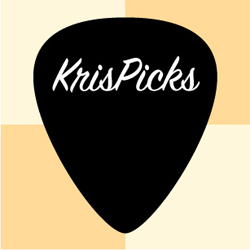 This pick produces a tone that makes acoustic guitars come to life! The tone produced with this pick has a warmness, with a touch of sparkle and airiness that I haven’t been able to find in any other guitar pick type. The sound draws me in and makes playing more enjoyable. Plus the pick glides over the strings for gorgeous sounding strums and arpeggiations. Highly recommended!